Bruges is beautiful place. I visited it during a particularly warm spell, when every part of the city seemed lit for camera. The tourist board must do all of its promotional photographs on days like that. It’s a wonderful place to walk around, and feels like a cultural waypoint that has drawn in equal parts of England, France and the Netherlands. There’s cobbles, those very specific step-like rooftops, little delis, lace shops, chocolatiers and of course: cafes and bars, where some of the world’s finest beer is available. I’m sure that many of you reading this will have been to Bruges. This was my first time, so please forgive me if my gleeful discoveries are all old hat to you. This trip meant quite a lot to me, because Belgian beer has always been a bit of a blind spot for me, and now, I feel like I’m so much closer to understanding and appreciating just how incredible it can be. These are the happy musings of a man who finally gets what all the fuss is about. These aren’t all the places I went to in Bruges, but they are my favourites of the places I visited. Please do share your own in the comments. Once a club and ‘rendezvous’ bar (a Belgian euphemism for pick-up joint), the 800 year old cellars on Kuipperstraat have been taken over by two men with a plan. I met the Manchester-born half of that partnership, Martin, who welcomed us into the cavernous yet cozy bar below the sunshine-bleached pavements of Bruges above. The lighting is gentle, provided in some part by a collection of pretty, mismatched light fittings acquired from second-hand shops. The bar itself provokes memories of home, or at least the UK. Shiny T-bars and fonts spelling out more than just the usual selection of blondes and lagers. Behind, a glassware and bottle-festooned backbar display, along with that most modern of touches: chalkboards displaying their regular and guest draught beers. The beer menus here are more than just laminated lists of names. Martin has ensured that almost every bottle beer they sell has a picture and description, to help people make wiser choices. He’s also more than happy to help guide anyone towards their ideal beer. Martin is a converter, a true believer in talking, showing and sharing. He’s one of those truly great bartenders, who goes about the day-to-day serving of great beer with a palpable sense of glee and accomplishment. He shrugs off the bar’s commerical ties to AB-Inbev as an easy compromise. In exchange for stocking 4 of their brands, he can stock 8 other draught beers, 12-14 guest bottled beers and 80 regular bottled beers at any one time. Belgian classics like St Feuillien Blonde and Troubadour Magma were stocked alongside Birrifico del Borgo’s Re-Ale and even the likes of Bateman’s Mocha and Marble Lagonda IPA (a nod to Martin’s Mancunian roots). While many bars can knock out a range of a few hundred bottles (see below), places like La Trappiste are a rarer, more precious thing. Here’s a bar with a real conscious identity that will always be able to surprise you. We visited this place twice. The first time was the best, for a few reasons. First of all, I didn’t know where De Garre was, only roughly were it was supposed to be. I didn’t know, for example, that it is down that little alley. So after several reconaissances, actually finding it was one of those proper Beer Moments ™, where the joy of finding somewhere almost equals the taste of the beer. Almost. The second time we visited was when we were tired and thirsty, having spent the balmy evening walking the streets and finding Billy Bragg doing a free gig on the Burg Square. The first time at De Garre was still the best though, because we met great people there: a couple from Preston and an older couple from, I think, Michigan. We never learned each other’s names (though to me, the American chap shall always be Bill, given his enormous resemblance to former President Clinton). Bill was a homebrewer (in that off-handed American way, you know, he just has a whole part of his house plumbed in for it, cold store, that sort of thing, real casual) and he was talking to the couple from Preston about beer local to Bruges. I chipped in that I’d just been to De Halve Maan (coming soon to a future blog post), and everybody started talking all things beer. We had the upstairs part pretty much to ourselves, and we had a great, happy few hours of sharing beer and stories. 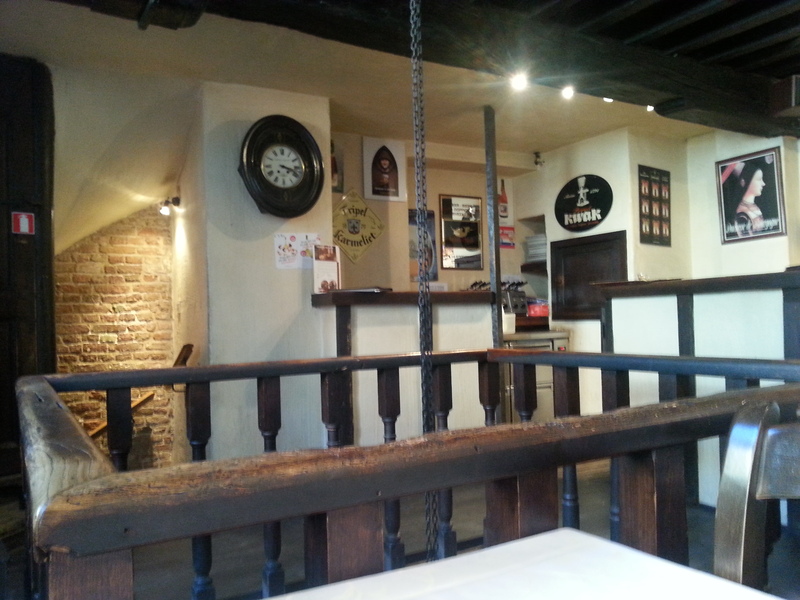 De Garre as a pub/cafe/bar is a very intimate, oak-beamed, cozy place that encourages conversation. A little too cozy, actually. The second time I was there I banged my head on the way out of the toilet. It feels almost British in layout, but naturally with a focus on bottled beer as opposed to draught. The taps should not be ignored, though. In fact, you are quite likely to be offered a glass of the house blonde beer, Tripel van De Garre, on the way in. Naturally, it comes served with some complimentary cheese. Highlights from the beer menu on our visit include Hercule Stout, a muscular 10% stout named after legendary Belgian murder-solver Poirot, and Troubadour Magma, a sort of rich, rye-super-ESB that had that trademark Belgian Balance ™ covering up its 8.2% strength. De Garre reminded me a lot of Arcadia in Leeds, which coincidentally was where I had ‘proper’ Belgian beer for the first time. It felt quite poignant to come to the source of both the beer and Arcadia’s aesthetic inspiration. 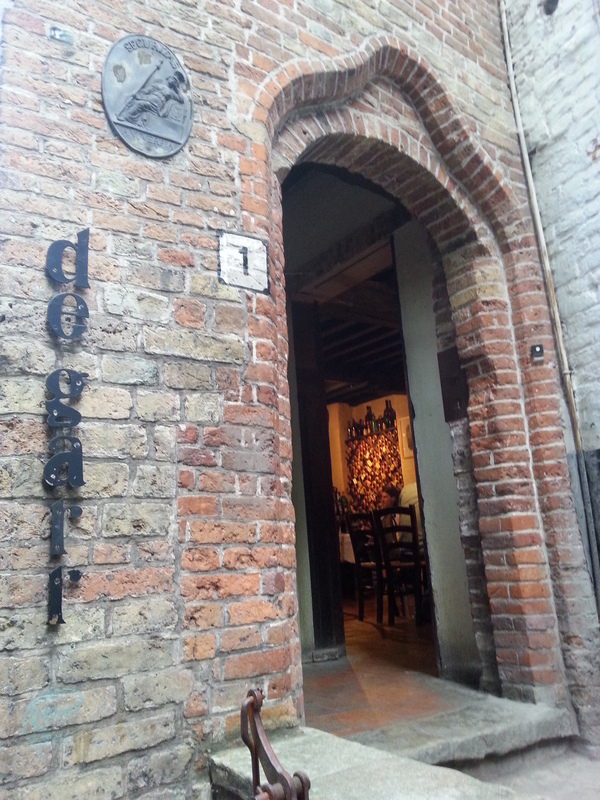 De Garre is a very warm, welcoming place, that becomes more than just bricks, mortar and beer. Its intimate atmosphere and perpetual background sound of cheerful conversation make it a charming, rewarding place with a life of its own. Haha. Yes, it might have some special gravity to it for Prestonites. 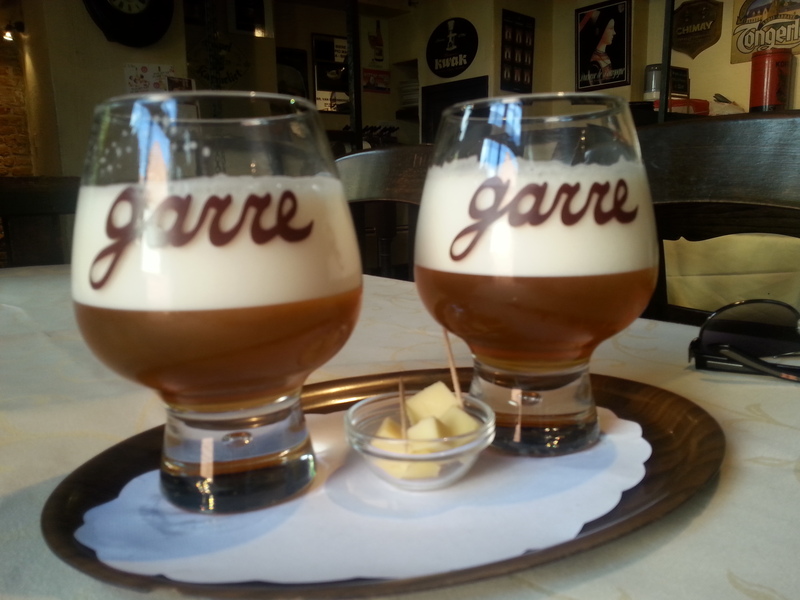 I loved De Garre. It felt like such a special place, and I loved the glasses the house beer is served in. A very classy bar indeed. Nice round-ups, man. 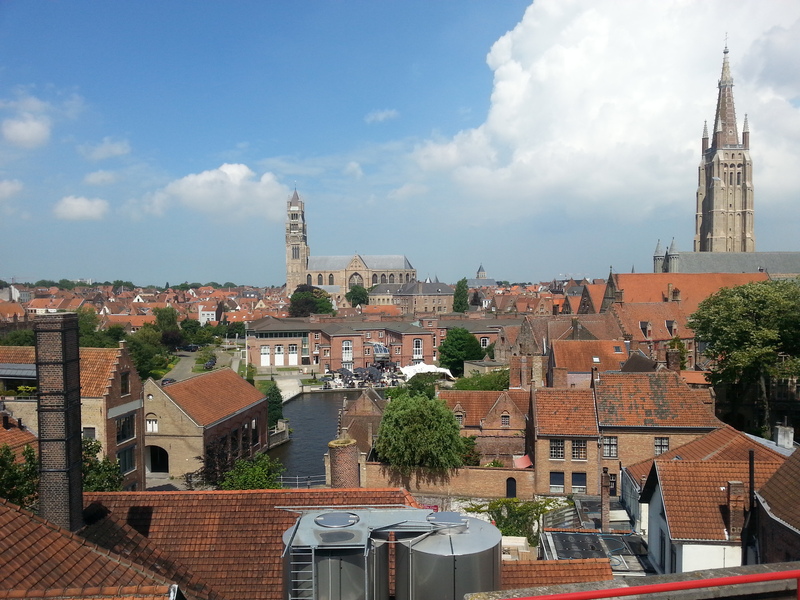 Bruge definately seems like a place I need to thistle up and go to! I love Taras Boulba, it’s the quenchiness (a word?) of it that gets me. Thanks, and I give Quenchiness my official thumbs-up as word, especially in describing Taras Boulba. What a beer. Previous Previous post: #EBBC13 – What did we learn?